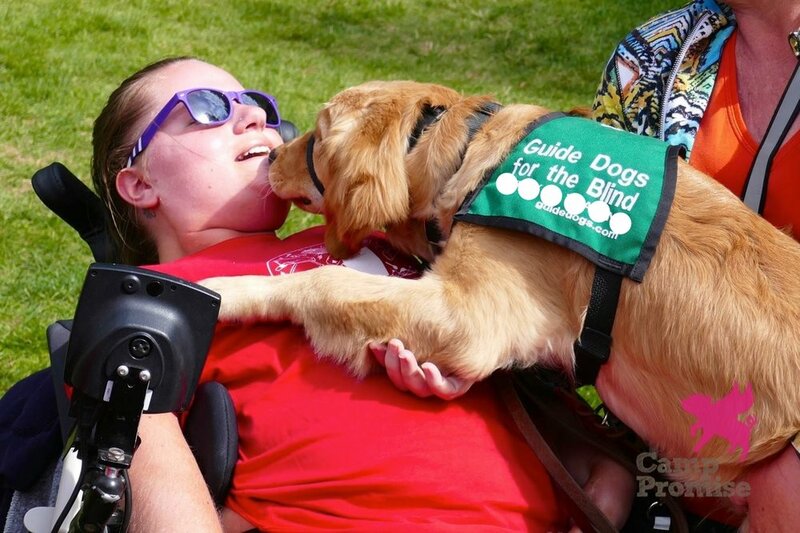 If you're wondering whether campers can bring their service dogs to Camp Promise, the answer is generally yes! 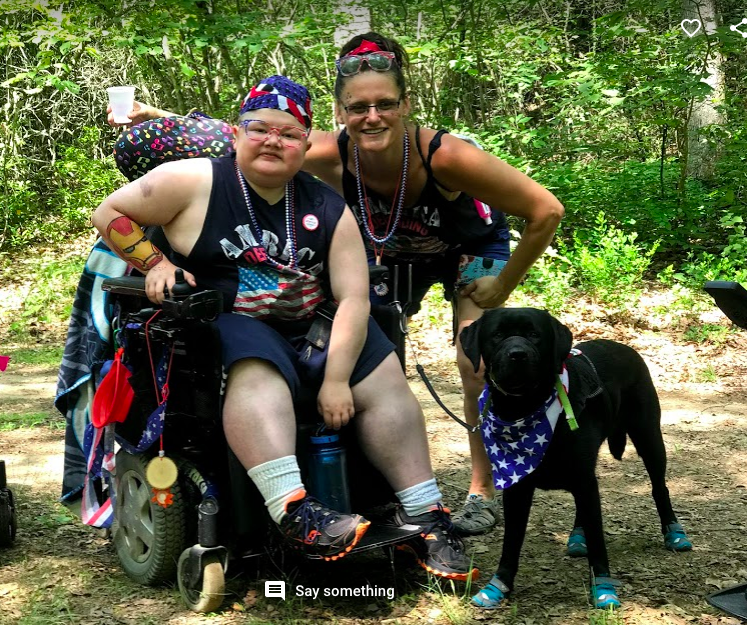 We've had lots of service dogs on duty at camp in the past (and two of them were even sisters who lived across the country from each other) and recognize that campers rely on their service pup to help them all day long. So yes, we want our campers to have that same support at camp and have six (6) recommendations for those who want to bring their dog along. First, your dog must be a trained service dog. We wish we could allow everyone to bring their home pets, but we can't. Also, camp looks and feels different than home, so keep that in mind when thinking about how your dog will respond to new stimuli. Do you think he/she will be able to handle the noise and excitement of camp? This is something to consider when making your decision of whether or not to bring your service animal with you. The noises, smells, and sights are not the same, so if your service dog is still in training, it might be best to leave them at home. Second, we request that campers include their service dog onto their application. This gives us advance notice to make sure we're ready to accept your furry friend at camp, too. There is some necessary planning that's needed in order for your dog to share the week of camp with you, and this gives us an official heads up. For example, we would need to make sure that campers who may be allergic to dogs are placed in cabins without dogs, and that you're not paired with a counselor who is allergic to dogs. So, be sure to check that box on your application as it will open the door for us to start the process and help you along the way to ensure we have all of the right information. Third, we will request a copy of your dog's vaccinations. Just like all of our human applicants, we need to make sure your pup is up to date on their vaccinations. This is done for the safety of our entire camp community. When you add your furry companion to your application, you will be prompted to upload their vet records. Fourth, we'll ask you to provide everything your pup will need for the week at camp. This includes things like dog food, a comfy bed, leash, treats, water/food bowls, etc. Essentially anything you usually use at home to care for your dog. We also ask that you can provide doggy doo bags to make sure we can clean up after them while on campus. Fifth, we recommend that Rover be used to taking commands from the camper. We understand that sometimes it's a camper and sometimes it's a parent who is the primary command-giver to service dogs at home. However, at camp, we need for your pup to be prepared to receive commands from the camper. So, if Rover usually take commands from other members of your household, we will want to talk about how that may look at camp when they are not present. 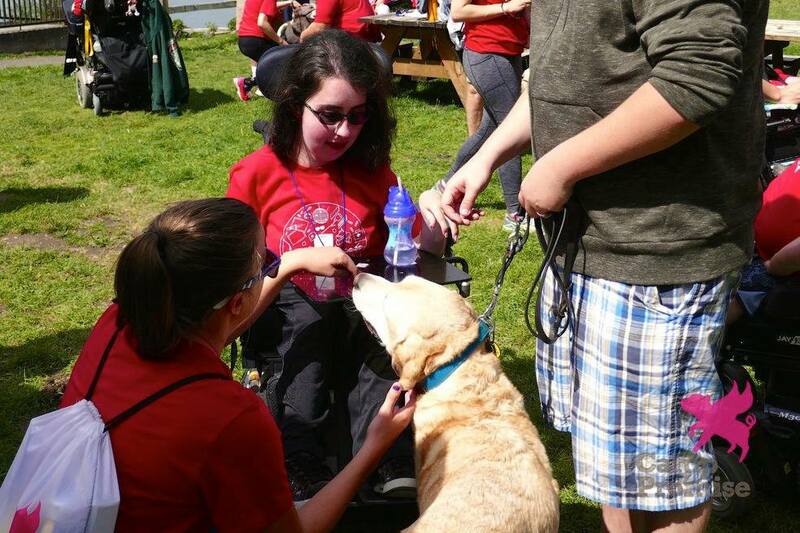 Sixth, campers and their counselors are responsible for service dogs during the week of camp. We'll rely on the camper and their counselor to make sure all furry friends get their walks in, are given plenty of food and water, are cleaned up after, and are ready to take on all of the fun of camp. Keep in mind that your days at camp are full of exciting, fun (and sometimes loud and crowded) activities. Having your service dog with you at camp can be a really great way to have the comfort and service that they provide while you are away from home. We would love to accept your partner in crime, just keep these few things in mind when you're planning out your Camp Promise week. PS- Don't forget to include your pup in your theme day plans. Make sure to pack some costumes for them, too!